Joomla VirtueMart Marketplace Daily Deals- Daily deals is an effective marketing channel with no upfront cost to merchants. With strategic pricing and good execution, “Daily Deal” represents very attractive marketing options for businesses that can’t be ignored and will always be in demand. Joomla VirtueMart Marketplace Daily Deals-Daily deals is an effective marketing channel with no upfront cost to merchants. 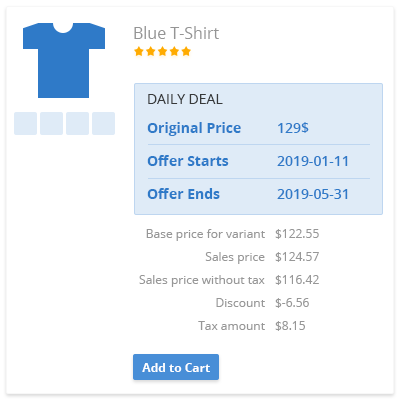 With strategic pricing and good execution, “Daily Deal” represents very attractive marketing options for businesses that can’t be ignored and will always be in demand. The limited time discount offer creates a sense of urgency. As a result, the Daily Deals company grow must faster than other companies. To create Daily Deals on products “Joomla VirtueMart Marketplace Daily Deals” extension is developed. This extension is used to create, view and edit deals on your online store. This allows you to create a deal for any product for a short interval of time in order to avail discount on that product. Did you buy Joomla VirtueMart Marketplace Daily Deals?